Claire Youmans is the Amazon Best-Selling author of The Toki-Girl and the Sparrow-Boy series, fantasy-adventure for Tweens to Adults, set in Meiji-era Japan. Book 1 (Coming Home), Book 2 (Chasing Dreams), Book 3 (Together), and now Book 4 (Uncle Yuta has an Adventure) are all out as of July 4, 2017, with Book 5 in the works. These and other works are all available EVERYWHERE including Amazon, Ingram, B & N, Kobo and more! As soon as you can make "arigato" and "konnichiwa" understood, people will start telling you how great your Japanese is. I noticed some time ago I wasn't getting that anymore. That's considered a milestone in language learning. Well, good. I've lived here a year and a half. I should be getting better. But in the last couple of months, I have noticed something new. Unless I am in an area populated by at least 50% foreigners, nobody speaks to me in anything but Japanese anymore, and often not even then. They take my ability to speak in reasonably competent Japanese for granted. I don't know why. When I run into a wall, where the conversation starts going over my head (and this happens fairly often) I now get cranky looks! I apparently speak well enough that I am supposed to be fluent -- at least for my present purpose, whatever that may be. Of course, I am finding this very funny. I just wish I were as fluent as they think I am, or should be. 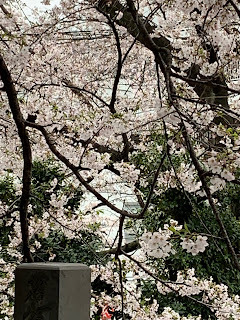 The cult of sakura is based on the notion that sakura blossoms are so fleeting that they must be cherished and enjoyed immediately, like life. Here today, gone tomorrow. Sorrow in joy. Be conscious of the moment with its splendor and its sadness. Live in the now. 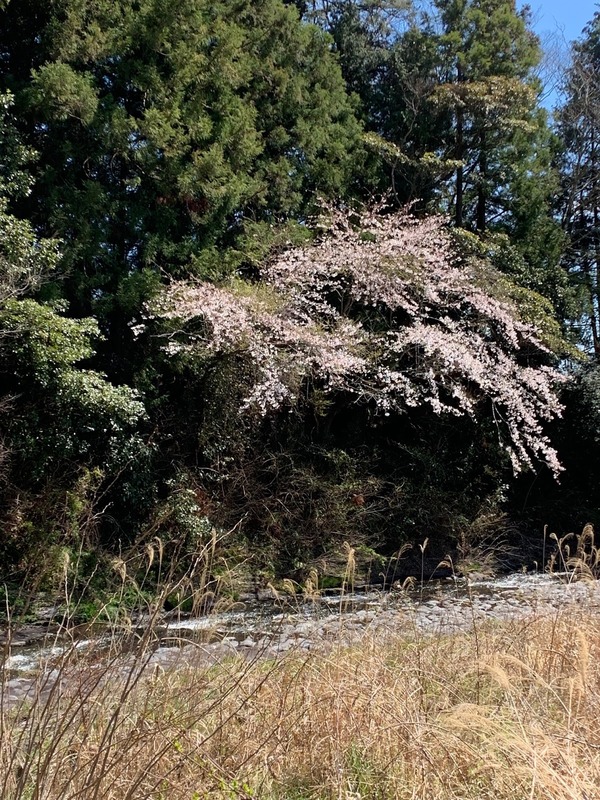 It's Tuesday, April 2, and the absolute peak perfection of probably the most popular of the sakura tree varieties is this week, with huge parties planned for last weekend and the next. Today may be the height of perfection for certain trees along my usual route. I duly went out an admired them. However, the season actually goes on for weeks. 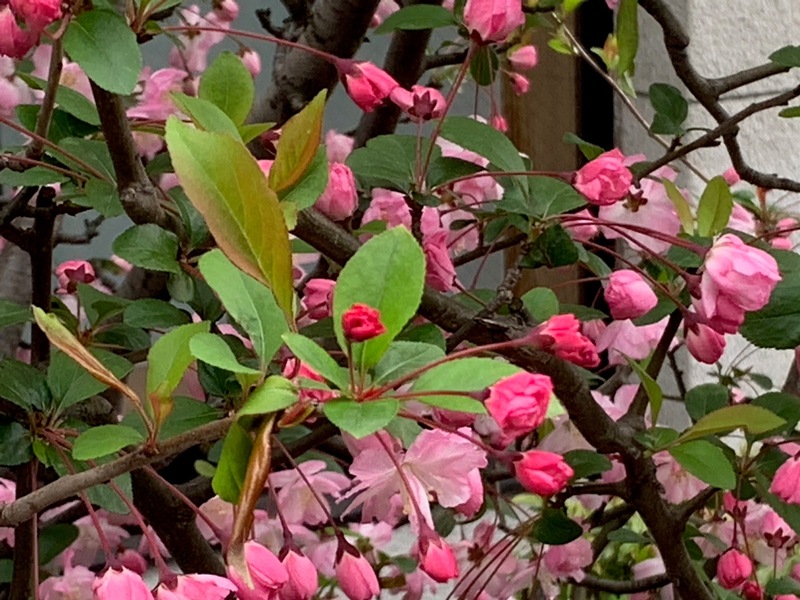 First the Official Bloom Predictors (I can't remember the name, but there is truly such a body, I think connected with the national weather service) issue a prediction for when the blossoms are most likely to start and peak in different parts of the country. They are alarmingly accurate. 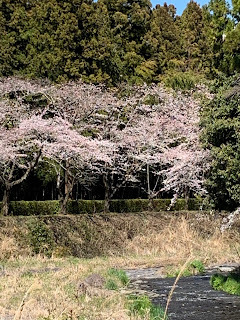 This prediction will be formally announced and sakura watchers will start checking trees on a daily basis so the forecast may be updated. People will start planning parties, large and small, public and private, reserving spaces in public places known for their blooms, hiring buses, reserving restaurants, catering picnics. This is a HUGE event. Food vendors will start selling everything pink and everything made with preserved blossoms from last year. They don't taste like much to me, but they are pretty. Like candy corn at Hallowe'en, it's the season so you have to buy some. People will plan trips to the country, so they must book train tickets (yes, there's a premium for the tickets at this season) and rental cars and hotels. Onsen resorts have probably been booked since last year. 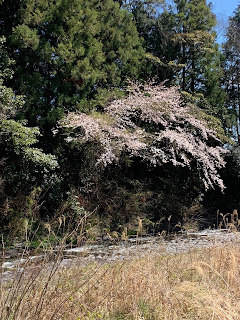 People like me, who have invitations to hanami (flower viewing parties and events) will also watch and enjoy seeing the flower buds swell on different varieties of trees, watching the early varieties color first, then bloom and now reach their peak. 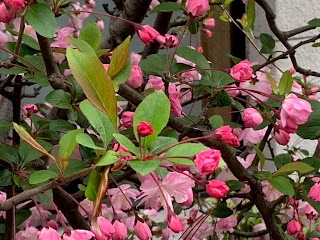 These will fade and the blossoms blow away as the leaves burst out and then the later varieties bloom, fade, fall and leaf out. It'll go on for another couple of weeks, easily. The whole thing takes at least six weeks. I try to think of the reason for all the excitement and enjoy every single second of it. And it really is wonderful! Today is March 16, which means tomorrow is St. Patrick's day. I like Colcannon and like to make it for St. Paddy's. 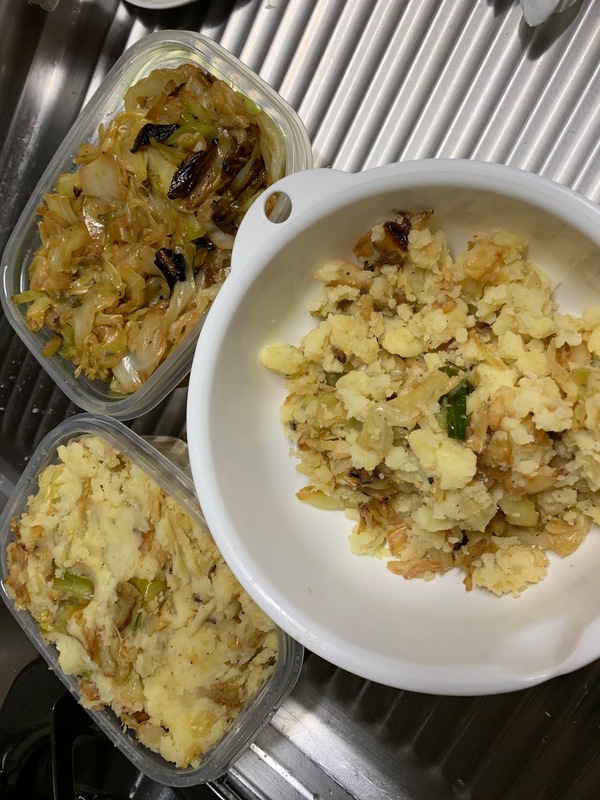 So this is a story of my day yesterday, as I went about making Colcannon. The weather forecast was good yesterday. That was great as Friday is normally laundry day for me. People don't use dryers here and I have no room for one. I need to be able to hang things outside or on racks inside, a very damp and inconvenient process to be avoided whenever possible. I got the laundry hung outside, rejoicing in my new laundry bar that is set up to let me hang sheets from clothespins and will allow me to simultaneously set up shade against the fierce summer heat and humidity that's coming, so my A/C bill doesn't resemble the US National Debt. I needed to clean house, a short horse that's soon curried, and do some work on The Dragon Sisters, so I did both. The forecast for today was rain. I needed to go to the closest Post Office so I could arrange to pay something directly from the Post Office ATM. I also wanted to go by a particular 100 yen store and see about picking up a certain kind of bar-hanging hook. Yes, I sound quite obsessive about laundry, and you would, too, if you lived here. This planned route would give me about the three mile walk, so great! The Post Office went well. I found a dear little vehicle I knew somebody I know would love, so I took its little picture. It appears to be a Daihatsu Kei Micro Van, and I can't find it's picture, but if you love cute little vehicles, you can now find it. I walked past one of the two organic vegetable vendors in the long Palms nakamise (shopping arcade; it's very long and complex) and saw celery! I have found celery very hard to find here. For 240 yen, I got 2 rather ratty looking stalks of what was unmistakably celery with lots of leaves. I had a plan! I also needed cabbage, and they had lovely but enormous fresh cabbages. I got the smallest one, only about the size of a soccer ball and weighing over 7 pounds. I also got MANY wonderful Hokkaido potatoes, probably another 5 pounds. They had a great price on smaller strawberries. The huge ones cost more, and do taste good, but the little ones taste just as good if not better, so I got some. Then I realized how much weight I'd committed to carry for a minimum of a mile. Too late now. Stopped and got the new bar holding hooks AND some weatherstripping. We're just about out of the worst of heating season and several months away from cooling season, but I did want to get this. I dragged my way home and up three flights of steps. Gomi day -- actual trash, not recycling -- was today. Oh, dear! I better get all those vegetables peeled, chopped and cooking! First I brought in the laundry, put it away and cleaned up the balcony and made sure my garden things were protected from rain. Moving towards spring; I want to have a shaded sitting area out there, tiny though it is. I realized then how different this day was from how managing the same stack of errands in the US would be. I'd be tumbling laundry dry rain or shine. I'd be setting up that payment account on-line. I'd still have to go to the grocery store, but I wouldn't have to carry things quite so far because I would drive. I wouldn't have to rush my cooking to get the trash out because I could take it out any day, not just the Designated Gomi day. Little things. One gets used to them. One forgets about doing things any other way. I do have celery leaves drying, and I do have Colcannon, however, and it's every bit as delicious as one might ever want -- and a good thing, too, because I have a LOT of it! You throw it in the dirt like garbage. Or that's what it feels like. Don't be surprised when never look at you the same way again. It's only their soul you discarded. Since I got back from skiing, I have finished the initial draft (draft one plus rewrites and revisions) of Book 6 of The Toki-Girl and the Sparrow-Boy series, The Dragon Sisters, and it's in the custody of its first set of readers. I'll get their feedback soon and will incorporate that, then off it goes to its editor so it can and will meet its planned publication date. I've talked to my Formatter Extraordinaire, and everything's rolling right along. I'll even be meeting with an artist for illustrations and more next week! This is very exciting! 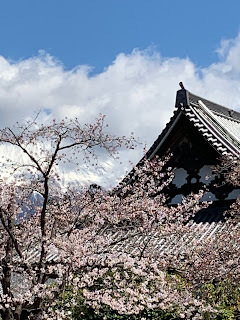 The technological developments of the late 19th Century mean that everything changed even more quickly than people had become accustomed to since the Meiji restoration. Such an exciting time and one reason new and different illustrations are needed. Seeing how my characters, human and otherwise, managed to cope with this incredible pace is fascinating. This wasn't just happening in Japan -- the Industrial Revolution changed the entire world. Japan, because of its previous isolation, its unique culture, and its complete rejection of the notion that it should become a Western colony, changed more and faster than most, while somehow remaining relentlessly itself. 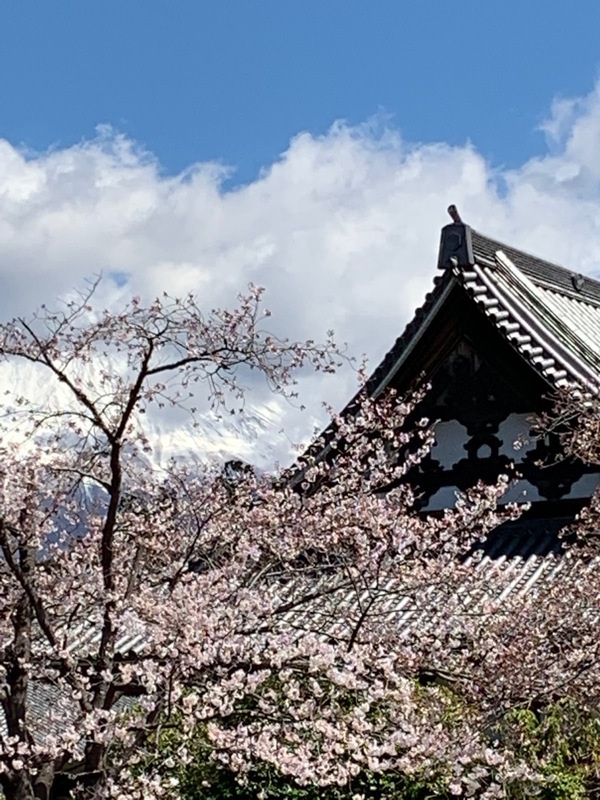 For many years, I traveled between the US and Japan trying to understand this culture and its people. I will always see Japan through a distinctly American eye. On the one hand, this gives me the ability to see things a native Japanese person wouldn't because they are part of the social and cultural landscape, so deeply ingrained they're not even noticed. On the other hand, I am constantly reminded of how little I know and how much I miss. Yet living here is making me an odd amalgam. Just the way I've combined my mother's Anglo-Indian Curry recipe with the classic Japanese take on that dish shows me how I'm mingling the cultures -- quite deliciously in that instance. I had to think quite a lot about the differences between my Western and Japanese characters as they learn to interact. It's no longer obvious to me how a Prince from the West and a Princess from the East would view monarchial succession, for example. The fact that they're dragons doesn't make it any easier. Or maybe it does. Madarao is a beautiful area. Nestled in the Japanese Alps out of Iiyama, not far from Nagano, it's a small area with one large hotel, a couple of medium ones, countless guesthouses, first class terrain, manicured tree skiing, fantastic snow and half the population of Australia escaping their incredible summer heat to take refuge in some excellent northern hemisphere snow-sports. The last part was a shock to me. 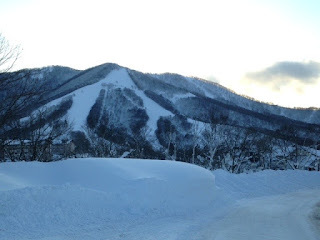 Japanese people love snow-sports. They're not alone in this. People from all over the world love to ski and board. I expected people from everywhere to converge on what is some of the best skiing in the world in the height of the season. I wasn't at all surprised to hear French, Italian and German as well as English in Tokyo station out of the mouths of people hauling ski and snowboard bags. The Japanese Alps, right square in the middle of the country, are known for their beautiful conditions and fabulous snow. Hokkaido, to the north, is legendary. There are dozens of resorts strung up and down the country. The conditions and snow are superb. The season, especially up north, is really long -- just what snow-sport freaks want! 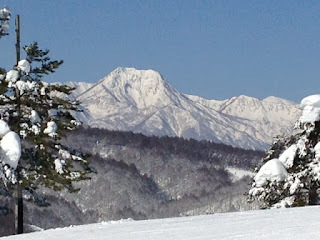 I picked Madarao because I was looking for a smaller area close to Tokyo that wouldn't be thronged with beginners and lower intermediates, that would have some interesting terrain, where I could find a small, comfy ski-in - ski-out lodge, easy to get to and preferably with an onsen. Madarao seemed ideal, and Kuma Lodge, while it didn't have its own onsen, was close to one and offered plenty of support in terms of pick-up and delivery and English speaking staff. It also had a cancellation when I needed it. You have to book early in Madarao. The end of September isn't soon enough. Australia's summer is hot. It's running 40 degrees C, which is 104 F. People want to get out. Japan isn't far away. If you like snow-sports, hopping on a plane for a week or two is a no-brainer. Remember, I live in Japan now. Even when I meet an English-speaking friend, I'm bouncing back and forth between Japanese and English and sometimes something else. I will go entire weeks without speaking a word of English. To land in a place where everybody was speaking English all the time with a pronounced Australian accent was a shock to my system. No yukata kimonos (the Australians bring pajamas; I didn't). Uh...towels? A bathroom glass? Avocado toast, jam, Nutella, eggs, cereals, juice, milk and ham for breakfast (what? No miso soup? No salad? Where's the rice?) I felt displaced. The skiing was great. The snow was phenomenal. The terrain was steeper than I thought at first but seemed easier than it should because of that lovely, perfect, fluffy snow. 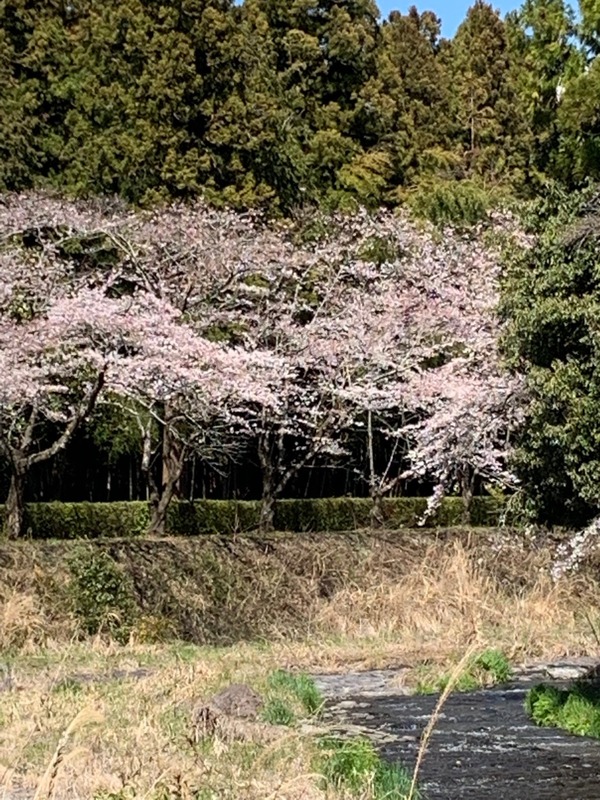 Since this is Japan, the tree-skiing areas, which I'd normally be cautious of, were manicured to the kind of perfection only a Japanese gardener could achieve. My boots were screwed up and the lifts are so low they're hard for me to get out of if I can't bend my knees, which I couldn't with screwed up boots, so that was...strange. However, I figured it out and the boots are now fixed and the skiing part was incredible. Dinner was, shall we say, amusing. The restaurants were either owned by Australians or the food was geared for Australian tastes. This means they do at least understand vegetarians don't eat fish and that diners like to tinker with menu offerings. They don't know how to make a Margarita, even when it's on the drinks menu. The pizza was...odd. I found some nasu dengaku (roasted eggplant in a miso sauce) that was beautifully done. Pickled carrots so good I made some when I got home. The variety of beer was staggering. The consumption of beer was likewise staggering. I found some French-Japanese style vegetables that weren't punitive in that they were properly cooked and actually seasoned. Nobody seemed to have heard of protein as a component of a vegetarian meal. One of the nice things Kuma Lodge does is make dinner reservations for its guests. It booked me into an okonomiyaki place called Sakura that was a little hard to find in the dark, in the snow. There was a man outside clearing the walk. He was Japanese, so I spoke in Japanese. I was in the right place, he showed me in and introduced me to the chef, his wife. I was early; it was empty. We chatted in Japanese and she brought me into the kitchen where she has a big teppanyaki grill where she works her magic, sat me at the bar, and proceeded to teach me how to make okonomiyaki, from the batter to the correct brand of sauce. 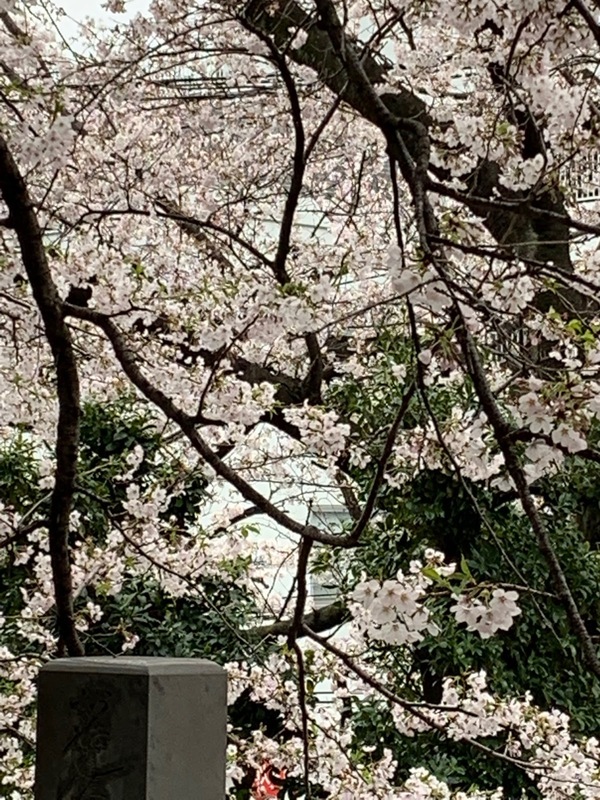 Suddenly, I was back in Japan, and I liked it. A couple of days ago I need to run an errand in Marunouchi. Tokyo station is there, and it's huge. Besides being a transportation hub -- and not really a nightmare because it's very well organized, just enormous -- it is in the middle of a skyscraper business district to which tens of thousands of workers flock each day, on every single train or subway line that passes through. That's in addition to the million or so travelers who pass through on their ways from here to there every single day. So what's Japan, and specifically Tokyo, to do? Make Tokyo Station a destination of its own, of course! Let's fill it with giant department stores, fashionable mini-malls, specialty shops, omiyage (souvenir) shops every hundred yards so you can't forget the all-important seasonal or location specific gift for your family, friends or co-workers, even if you actually did! And of great importance to all, always, myriad places to eat! Ramen is the hot food trend of the last couple of years. This isn't the 5 for a dollar starving student special, however. Ramen is fast food, true, with noodles quick-boiled then drenched in broth and topped with a variety of savory toppings, but the real thing is hand made, fresh and superbly delicious. Unfortunately, it is almost never vegetarian. If you are a ramen connoisseur, you know that the noodles must be perfectly made of the finest ingredients and cooked just to the perfect al-dente point. You know that the additions of meat, vegetables, fish cake, hard cooked egg, garlic chips and more that sit on the top must also be perfect examples of their kind. Most of all, though, the broth, the soup stock, must be a work of art. Stocks are nurtured in Japan much as they are in France. They sit on the back of the stove, simmering happily, with liquid added as needed and flavor basics, whether bones, onions, carrots, garlic, skin, organ meats or whatever else the chef deems necessary or desirable for soup perfection added as ingredients become available, as they become seasonal, or as the chef's palate thinks appropriate. I have heard of stocks that have been simmering away for more than a century. I can't very well go into a ramen restaurant and say "Yes, I'd like some ramen, please, but I'm a vegetarian, so I can't eat your great-grandfather's 123 year old pork stock, or your great-grand-mother's 108 year old fish stock. Just some instant seaweed soup will be fine." Nope. Can't do that. Not unless I want to be deported for culinary crimes against the nation. So it was with great delight that I heard there were TWO ramen restaurants on Tokyo Ramen Street in the lower level of Tokyo station that actually served vegetarian ramen. I was able to locate one of them -- I don't know what happened to the other; I looked for both -- stuck my bill in the menu coupon machine and was able to select from no less than two kinds of vegetarian ramen (eggs) and one kind of vegan ramen (no egg.) Three choices. That's almost unheard of in any restaurant when you're veg. It was every bit as good as good ramen is supposed to be, only I could eat it. There was a schmeer of yuzu and chili paste on the side of the bowl that demanded to be mixed in. Garlic chips, hot red and black pepper and salt were on the side to add as you liked. Fried lotus root, pumpkin and goodness knows what all floated on top of a nest of perfect noodles cooked to a perfect bite. Then there was the broth. Oh, my, the broth. I couldn't even tell what was in it exactly, as it had simmered long enough to create a perfect marriage, but it was definitely veg. There were chili peppers in it. Maybe some tomatoes. Konbu kelp, perhaps. Shiso? All I can tell you is that it was just a little sweet and the pinnacle of vegetarian perfection. There was so much I couldn't finish it all, which was a shame, because it was so darned good. In Tokyo station, go downstairs and find Tokyo Ramen Street. You don't need a ticket to get there. Signs in a variety of languages will direct you there as will a handy booklet, also in many languages. You're looking for Soranoiro Nippon, in Location 2. There's a ticket machine outside. There will also be a nice staff member right there who can tell you which items are veg. (They had a light green background when I was there, and the picture will detail ingredients. They have pork and fish stock based ramen, too, if you like, and I'm sure those are just as delicious. Insert your money, take your ticket and you'll be directed inside where you can take a seat. In minutes, you'll be in Ramen Heaven. Definitely worth the trip.